In this inspiring book, Donna Phelan takes a new and refreshing approach to retirement planning for women. Told from the perspective of the four Strong sisters – one married, one divorced, one widowed and one who never married – this is the powerful story of each sister’s journey on the road to retirement success. This insightful book relates how each sister’s circumstances influenced the path she would take in her own retirement planning, and the lessons each needed to learn in order to succeed. As a seasoned professional on the front lines of some of the world’s largest and most respected investment firms, helping people plan for retirement is Donna’s job. She has spent the past two decades lecturing, writing, and working closely with her clients as they manage their investments and plan for the future. She knows that retirement planning can be scary in today’s uncertain world, and that women face many unique financial challenges that their male counterparts do not. Donna is passionate about showing women how to create their own financial security and retire well – speaking in language that is easy to understand and follow. Innovative and encouraging, this book provides effective strategies for women who feel they are behind in saving for retirement. Donna demonstrates how to establish income for life by setting up SISTERS: Stackable Income Streams To Empower Retirement Security. In seven simple steps, Donna guides her readers through creating an investment portfolio, managing credit, building a profitable business, and even joining with other women to create SISTERS Clubs. WOMEN, MONEY AND PROSPERITY: A SISTER’S PERSPECTIVE ON HOW TO RETIRE WELL removes the fear and uncertainty from retirement planning, empowering women to live out their golden years with dignity, confidence, security and peace of mind. 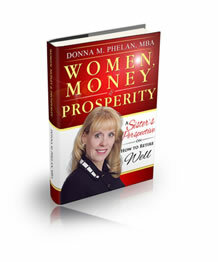 Donna M. Phelan is the author of Women, Money and Prosperity: A Sister’s Perspective on How to Retire Well. Donna has spent 19 years at some of Wall Street’s largest and most prestigious investment firms. She holds an MBA in Finance from the University of Connecticut, and provides personal finance advice to clients in twenty states coast to coast. She has been featured in USA Today, Yahoo!Finance.com, CNBC.com, NBC.com, and The Houston Chronicle, among others. Donna has lectured at conferences nationwide on a broad range of financial topics and is the author of numerous articles on investments, retirement and financial planning. Donna was formerly President of the American Association of Individual Investors (AAII) Connecticut state chapter and was active in the Financial Women’s Association (FWA) in New York. She is currently a member of the South Bay Estate Planning Council in Los Angeles. Prior to working on Wall Street, Donna was Principal of a jewelry design and manufacturing company whose customers included Tiffany & Co, C. D. Peacock, and Cartier, for whom she did freelance design.